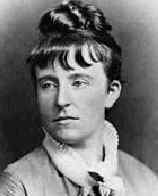 Frances Hodgson Burnett, Anglo-American novelist, was born Frances Eliza Hodgson in Manchester, England, on the 24th of November 1849. In 1865 she went to America with her parents, who settled in Knoxville, Tennessee. Miss Hodgson soon began to write stories for magazines. In 1873 she married Dr L. M. Burnett of Washington, whom she afterwards (1898) divorced. Her reputation as a novelist was made by her remarkable tale of Lancashire life, That Lass o’ Lowrie’s (1877), and a number of other volumes followed, of which the best were Through one Administration (1883) and A Lady of Quality (1896). In 1886 she attained a new popularity by her charming story of Little Lord Fauntleroy, and this led to other stories for children. Little Lord Fauntleroy was dramatized and had a great success on the stage; and other dramas by her were also produced. In 1900 she married a second time, her husband being Mr. Stephen Townesend, a surgeon, who (as Will Dennis) had taken to the stage and had collaborated with her in some of her plays. Burnett's plays include Esmeralda (1881), which she wrote with the American playwright William H. Gillette. She considered The Secret Garden (1911) her best novel; it is still popular today and has been made adapted into several films. After the death of her parents, a young girl, Mary Lennox, is sent to live with her mysterious uncle in an even more mysterious house. She finds companionship through her cousin, Colin Craven, and a boy, Dicken. Mary finds the entrance to a secret garden, taking her fiends along, and they resow the garden, a metaphor for the life Mary brings to the house and to her uncle, Lord Craven, who has been stricken by the death of his wife and a physical affliction.